Baby Chest Congestion is a common problem which every baby faces frequently due to their developing immune system. Learn how to relieve chest congestion and cough in newborns and infants when there is no other bad symptoms like fever or vomiting. Here are some home remedies to help you to clear babies chest congestion and to give soothing effect. Infants get chest congestion very easily as their immune system is not mature. However, let us try to avoid it as far as possible because the babies suffer a lot when they have congestion. Sadly, you have to take the babies to doctor if the baby has some other symptoms of illness like fever or vomiting in addition to chest congestion. Doctors will identify the reason behind the illness and prescribe correct treatment. If your baby has just chest congestion due to common cold with no other serious symptoms, you can try the home remedies to clear the chest congestion. If there is no sign of improvement, please call the doctor. As I said, make sure that the baby's chest congestion is due to common cold and nothing more serious. You can follow the below home remedies which are quite natural remedies to treat the infant chest congestion. If the symptoms persist for a prolonged period of time, it indicates a more serious condition. In that case, you need to call your doctor for further treatment. Even if the baby has difficulty in breathing or nursing, you have to call the doctor. Consider placing a humidifier or vaporizer in your baby's room. It adds moisture to the room. Use clean humidifier. Do not run it full time. Use only as and when required. If you do not have humidifier, you can boil a pot of water and keep it simmering. You can have the baby in the room for sometime. Making the baby to sit in a steamy bathroom helps to clear the stuffy nose. Let the hot shower steam up the bathroom. Once the bathroom is enough steamy, you can take the baby and keep there for sometime. Make sure that the bathroom does not become too much steamy. Otherwise the baby will feel uncomfortable. The steam helps to loosen out the congestion. Most of us bath the baby in warm water only. Continue doing that. You do not need the baby to take head bath. Just consider giving a sponge bath with warm water. Your baby will feel very soothing. Always use a clean sponge. If you do not have sponge, you can use a clean towel. Make sure that the water is not so hot. Baby gets dehydrated quickly when they suffer from chest congestion. If the baby is less than 6 months old, continue giving him/her breastfeeding more frequently. If the baby is more than 6 months old, you can consider giving him warm liquids also in addition to breastfeeding. It helps to relieve congestion and the baby will feel very soothing. You can give warm water and liquid soups. To get quick relief from chest congestion, you have to make sure that your baby gets enough sleep and rest. Consider not taking them for shopping. Avoid outdoors as far as possible. You can take them for sometime to get some fresh air but not for long time. Massaging the baby's chest, back and feet with warm coconut oil can be very soothing for the infants. If your baby is more than 6 months old, you can use garlic oil massage for chest congestion. Don't overdo it. Peel a garlic clove. Take 1/2 table spoon of coconut oil in a pan. Heat it in low flame. Once the oil becomes hot, add garlic(add half garlic if the size is big) and roast it till nice aroma comes. Switch off the stove. Leave the oil rest for sometime. Once the oil becomes warm, you can take out the garlic and you can use the oil to massage. Make sure that you do not leave the oil unattended while heating. Rubbing the oil in baby's chest, back and feet helps to get relief from infant chest congestion. Check whether the oil is overpowered with garlic. In that case, add some more coconut oil. Some people uses camphor instead of garlic. I have tried camphor for cold only when my kid completed one year. Do not make the baby to lie flat on his back. Elevate the baby's head with soft baby pillow. 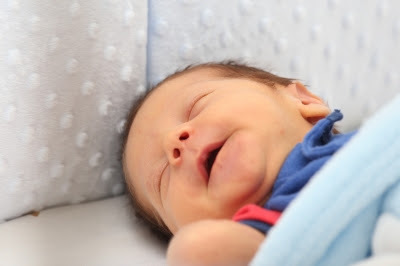 If you put him in cradle, place few soft cotton clothes to slightly elevate the baby's head. These are few simple natural remedies we follow to treat baby chest congestion with no other symptoms. This is just a knowledge sharing article. Use it for reference and it is not a substitute for professional consultation. When your baby is feeling uncomfortable, put him on your shoulder and gently tap his back with cupped hand. You can tap on his chest too. It helps to loosen the mucus and give warmth feeling to the baby. 1. Some people have suggested to use honey for babies. Actually honey is a very good natural remedy for chest congestion. But I have read in many sources that honey should not be given to babies who are less than 1 year old. I made sure that I have never given honey to my kid till he became one year old. He is 4 years old now. Nowadays I love to give him sitharathai for cold. It works very well. After 3 doses of sitharathai with honey, I could see a very good improvement in cold and chest congestion. 2. The above remedies all are all very natural and give a very soothing feeling for the chest congestion. As far as we do not give anything give internally to babies, there is no harm in trying them. 3. Some parents apply vicks vaporub for babies. I have never seen vicks for babies at least in the local market. Also, I am not very sure whether it is completely safe for infants. So, I avoided using vicks for baby. 4. You can follow these natural remedies even if you are giving medicines prescribed by doctor to the baby. It helps for speedy recovery from infant congestion. 5. Though it is better to avoid outdoors especially in winters when your baby is suffering from chest congestion, you can take him for quite sometime to get fresh air. Also, do not keep the windows closed all the time. Let the room be ventilated at least during day time and allow the fresh air to come in. 6. When the mucus gets dried up and accumulated around the baby's nose, use a pure cotton bud dipped in water to gently clean it. You can also use a clean and soft cloth dipped in water to do the job. Do not rub the place. If the mucus is very hard to clean, take a drop of water in your fingers and apply around the nose gently. Leave it for few minutes to allow the mucus to get loosened. After that it will be easy to clean the mucus. Keep the area moisturized always. You can apply coconut oil gently. Be it water or coconut oil, do not apply more as it might enter into the baby's nose. Use only required amount to cover the area. You would need only one drop for an infant. Keep changing the cloth frequently. Discard the cotton bud after one time use. 7. Keep your hands cleaned well all the time when you handle the baby. Use a hand wash to clean your hands thoroughly. 8. No air conditioner please. It will worsen the congestion. I have observed it at least for my baby. Even keep the fan in low speed. 9. If you are breastfeeding your baby, try to include garlic in your diet. It is very good for cold and congestion. 10. We need to understand that common cold and congestion is quite common in infants as they have low immunity and it can be easily treated. But you should be able to differentiate between common cold and other serious problems based on the symptoms. So, keep watching the baby. 11. If your infant is suffering from normal chest congestion, he should start recovering from day 2 after following these natural remedies. We cannot expect the baby to recover immediately in one day. But there should be sign of improvement and there should not be any sign of things becoming worse. In that case, you have to call your doctor. For toddlers we have many natural remedies like Honey and Cinnamon for cold, Ajwain for cold and Turmeric Milk for cold. You can also give them natural health tonic for toddles every weekend.